UPDATE: After a huge amount of work and fundraising, Naomh is very close to her target and needs one last push. Please take a moment to watch a video from Naomh here. 3995. 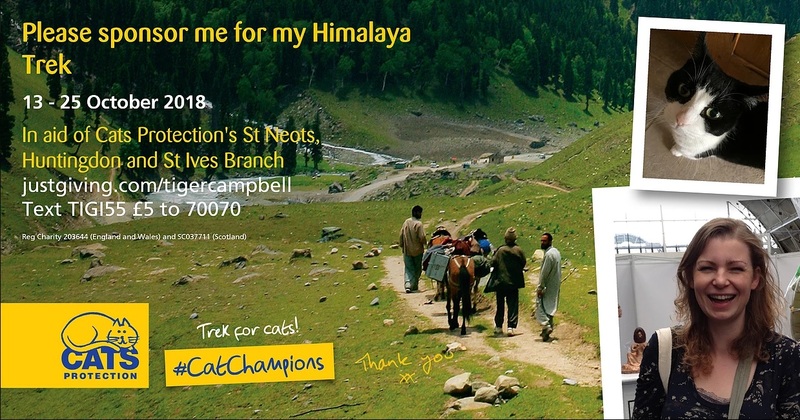 This is not only the amount in pounds Naomh needs to raise to take part in the Himalayan trek & tiger conservation project for Cats Protection, but its close to the depressingly small number of tigers we have left in the wild. Or you can drop it into our charity shop in St Neots. Please mark all tiger toys for the attention of 'Lesley - Coordinator'. Details of the secret project will be revealed soon...!